External GPU enclosures can be pretty massive. Sonnet has a solution to the problem with the portable eGFX Breakaway Puck — and AppleInsider has one to test. The eGFX Breakaway Puck comes in two models, one with a Radeon RX 560 similar to that in the high-end 15-inch 2017 MacBook Pro, and a second with the Radeon RX 570 as found in the high-end 20.5-inch 2017 4K iMac and one model of the 5K iMac — we have the RX 560 model on-hand. The enclosure provides three DisplayPort 1.4 ports, and one HDMI 2.0b port, all capable of 4K resolution at 60Hz. At present, the RX 560 model needs a relatively minor hack to work, but we expect that this requirement will be exterminated once full support for external GPUs arrives in the spring. 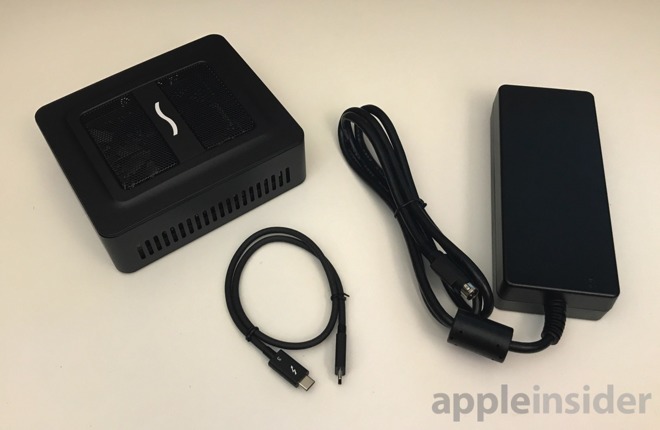 The unit provides 45W of charging power to connected laptops through the Thunderbolt 3 port. While not sufficient to maintain full charge when a computer is under heavy load, the unit provides sufficient power to significantly reduce battery drain and will charge a connected computer fully given time when not in use. 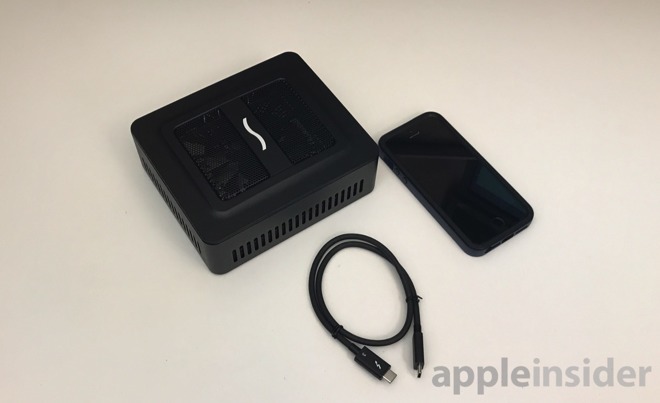 The unit measures 3.2 pounds, 6 inches wide, 5.12 inches long, and 2 inches tall — seen pictured with an iPhone SE in a Newer KX case for comparison. 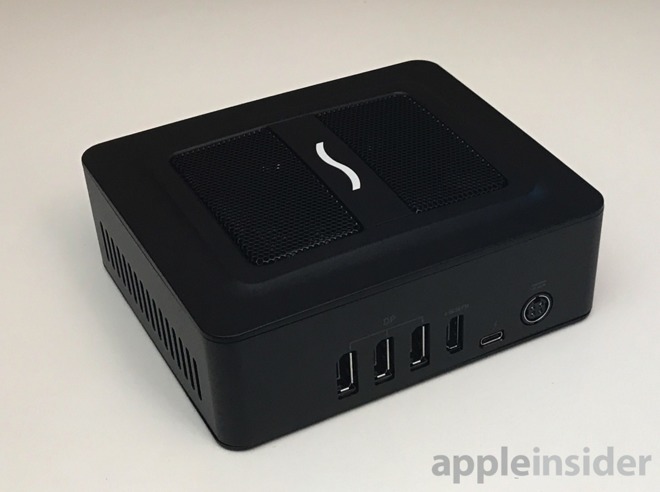 While Apple was rumored to be working on a display with an integrated GPU, Sonnet may have a solution for inventive users. We've also got the VESA "PuckCuff mount for the breakaway puck on hand, so going forward we'll experiment with strapping the Puck to the back of a display, and see what we can do about attaching it to our wall-mounted articulated arms. But, don't plan on using the included Thunderbolt 3 cable for this. At 18 inches, it is far too short to be of any practical use. Plan on spending about $50 for a longer, active cable. Initial AppleInsider tests show the RX 560 to be faster, but close to the speed of the GPU included in the 15-inch 2017 MacBook Pro. We haven't strained the pair in parallel at this point — so a closer examination will have to wait for the full review. Non-quantitative observations show the eGFX Breakaway Puck to be slightly quieter than the eGFX Breakaway Box with the RX580 PCI-E card installed, but as with benchmarks, a more precise measurement will have to wait for the full review. The eGFX Breakaway Puck Radeon RX 560 has a retail price of $449. The higher-end eGFX Breakaway Puck Radeon RX 570 retails for $599. The optional PuckCuff VESA Mounting Bracket Kit sells for $59.